As promised, as of this post I am all caught up posting my 365 project. If you haven't been following along, a 365 is a photograph-a-day project for an entire year. Mostly, these are images of my family's daily life from the school bus stop in the morning to the bedtime stories at night. I try to capture a special moment each day or, at the very least, a snapshot of one of these cute little faces. I'm in a little bit of a stale phase right now, but am working on incorporating a 100 Days of Summer project into the 365 starting Memorial Day weekend. If you'd like to join me, leave a comment and I will keep you posted on the next steps! Day 119: Trying on my sunglasses while waiting for the school bus to bring the big kids home. Day 120: Chocolate cupcakes cooling. Day 121: Playing dress up at Grandma's house. Day 122: S'mores on the cub scout camping trip to Gettysburg. Day 123: Things sure would have been different if she had been born 125 years ago. Day 124: Enjoying her peanut butter and jelly sandwich. 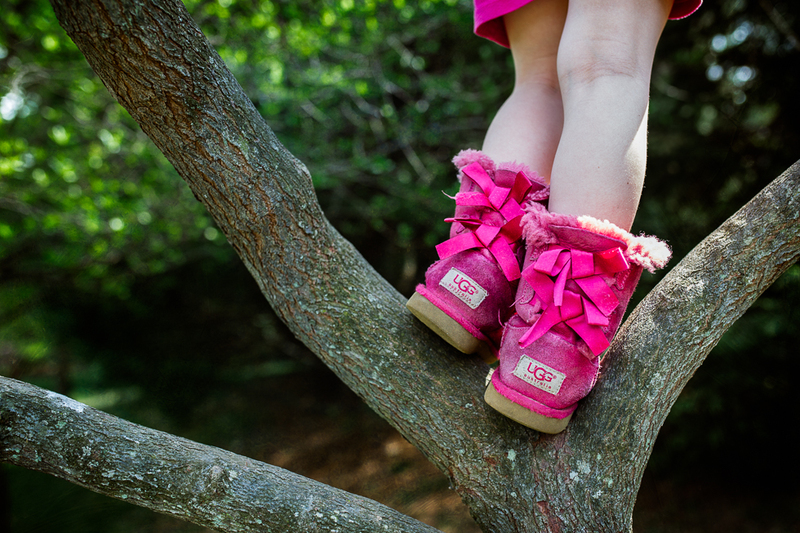 Day 125: Uggs, in a tree, with shorts? Part of my ongoing "Because She is Four Project"Day 126: His room. I was more interested in the amazing afternoon light by his bed, but he was not so thrilled with the idea of moving.Day 127: This face…and a soccer shirt. Day 128: The Twinks--"twin" cousins who were born on the same day about 45 minutes apart. Day 129: Living art--My amazingly talented friend, Katie Meredith of Katherine Meredith Portraits, served as face painter extraordinaire at the elementary school fair. If you haven't had the opportunity to check out her work, you should. Her work is incredible. Day 130: My sweet niece on Mother's Day. Day 131: So the story behind this is that her sister was silly enough to forget to get off the school bus, so all the kids ran to the next stop to attempt to retrieve her. This little one got left behind. Day 132: The Panamanian Golden Frogs at the Maryland Zoo in Baltimore.